Reprinted with the kind permission of Antiques & Auction News, February 2011. A chapbook is a small book or pamphlet that contains compact literary works. The term chapbook, coined by nineteenth-century bibliophiles, came into familiar usage long after this type of book became popular. The root word chap derives from the Old English word ceap, meaning trade. Interestingly, chap was first applied not to the books but, rather, to the men who sold them. 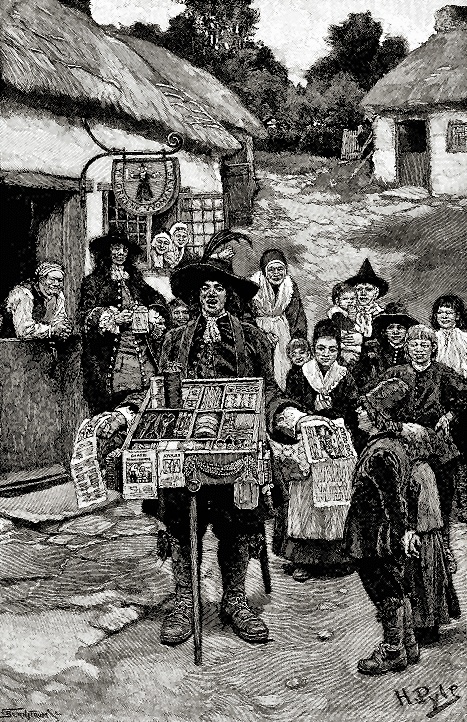 Beginning during the 1500’s, small books were sold by itinerant peddlers called chapmen (also colloquialized as cheapmen) who traveled through England's rural villages typically hawking their wares door-to-door, on street corners, and at markets and fairs. Most carried these easily portable and inexpensive books in boxes and sold them for a groat or less each (a groat was a British silver four-pence piece used in trade during the fourteenth through seventeenth centuries). Chapmen were characteristically nomadic, roguish figures who lived on the margins of society. Early chapbooks were waistcoat pocket-sized and usually produced in printings of eight, twelve, sixteen, or twenty-four pages printed on both sides, folded to resemble small books, and simply stitched with the outside pages serving as covers. Paper quality was of the poorest (it is reported that early chapbooks were sometimes purchased as a paper source for wrapping and as "bum fodder" or toilet paper), and illustrations were limited to the crudest quality "recycled" woodcuts that were often incongruously reused in numerous chapbooks regardless of their relevance to the text. Of little interest to the elite and to the up-market literati, chapbooks became the poorer person's form of printed literature with content geared to semi-literate tastes and including popular ballads and songs, tales of medieval times, poetry, almanacs, guides to fortune telling and magic, political treatises, religious tracts, and downright bawdy stories. Dodgy dealers and risqué subject matter aside, chapbooks figured to a significant extent in the transition from sung ballads to printed texts as evidenced in the story of Guy of Warwick. This story originated during the middle ages and was originally sung as a heroic ballad that was widely known among all classes of people. At some point between 1200 and 1400, it was written as a manuscript available only to the scholarly and to the rich. During the first decades of the 1500’s, it was printed for the gentry, and later in the 1500’s it was abridged into broadside format as a ballad meant to be sung. By the late 1600’s, the story of Guy of Warwick appeared as a twenty-four page chapbook with a target audience of lower class readers. While the upper classes and members of established literary circles would have seen this as a vulgarization, chapbook versions brought Guy's narrative to a wider readership and secured the story's place in both literary history and popular culture. Chapbooks saw an increase in status between the 1500’s and the 1700’s as literacy rates rose, and chapbook popularity may be measured by surviving records. It has been noted that Oxford bookseller John Dorne documented in his 1520’s day books that he had sold up to 190 ballads a day at a halfpenny each, and as many as 400,000 almanacs were printed annually by the 1600’s. In 1664, the probate inventory of printer Charles Tias (owner of The Sign of the Three Bibles on London Bridge) included printed sheets to make about 90,000 chapbooks and 37,500 ballad sheets. In 1707, printer Josiah Blare (of London Bridge’s The Sign of the Looking Glass) listed 31,000 books and 257 reams of printed sheets. Such printers either sold chapbooks to chapmen cheaply or supplied them on credit that was paid off when the books were sold. While chapmen facilitated extensive distribution of the first chapbooks, they also provided printers with information on which subjects were "best sellers". Accordingly, the trendiest chapbooks were reprinted, edited, pirated, and reproduced in numerous editions. Printers and publishers often issued catalogues, and some are recorded in the libraries of provincial gentry and yeomen. Extant records suggest that chapbooks were important to the people who owned them: in one example, Quaker Yeoman John Whiting, while imprisoned in Somerset during the 1680’s, had his chapbooks sent from London by carrier and held in keeping for him at a nearby inn. The chief center of chapbook production was London (at least until the time of the Great Fire in 1666), and most of the chapbook printers were based in the area around London Bridge. However, numerous smaller-city chapbook printers joined ranks with city publishers and catered to the more rural public. Chapbooks were especially popular in Scotland, where literacy rates tended to be higher than in other parts of the British Isles. Glasgow and Edinburgh became centers for chapbook production, and smaller cities such as Paisley, Stirling, Falkirk, and Dumfries followed suit. British cities immediately south of Scotland’s border (including Newcastle, Carlisle, and Penrith) published chapbooks for both English and Scottish readers. Many early chapbooks are held in the collections of Samuel Pepys (dating from 1661-1688, housed at Magdalene College, Cambridge) and Anthony Wood (some 65 editions that include twenty from before 1660, housed in the Bodleian Library). By the nineteenth century and the reign of Queen Victoria, chapbooks entered a modern incarnation. At that point in its history, the chapbook was included among various ephemera or disposable printed materials, including pamphlets, political treatises, religious tracts, nursery rhymes, folk tales, almanacs, and poetry. Most (improved in quality and appearance and with covers) were illustrated with popular prints of the Victorian era and are an example of the mass production focus of their time. Chapbooks also saw a transition from adult to children’s literature during the nineteenth century when literate adult Victorians "outgrew" their fondness for the reading material printed in earlier chapbooks and looked for literature that would explain the rapidly changing and often perplexing Victorian world. As adult reading preferences changed, chapbook publishers began to accommodate young readers, especially those of the newly emerging middle class. Sadly, not all children were able to enjoy chapbooks as a source of entertainment. As nineteenth-century publishers began to produce chapbooks for young readers, they often employed children to painstakingly hand color illustrations. It is ironic (and like so much that was paradoxical in Victorian England) that many poor children worked long, arduous hours, often in the meanest conditions, coloring drawings in chapbooks that were supposed to amuse and entertain them. For children employed in the book industry, it is unlikely that the chapbooks they worked to color brought them any pleasure at all. Although chapbooks were especially popular in England and Scotland, they were also published in the United States and across the globe in such countries as Russia (where they were linked to the rise in literacy after the emancipation of serfs in 1861). As the nineteenth century progressed through the dawning Age of Industry, the chapbook's popularity began to fade. Advancements in printing techniques and lithography, inexpensive reproduction of important artworks, amplified production of bound books, and improved transportation systems powered mass distribution of newspapers and periodicals and buttressed cheap production and dissemination of hard bound books - uncompromising competition for the humbler chapbook. Promoted in part by low-cost copy centers, as well as by computerized and digitalized printing, chapbooks enjoyed a more contemporary renaissance during the latter years of the twentieth century. The term chapbook currently describes small, inexpensively-produced books, usually about 4-1/2 by 5-1/2 inches in size, saddle-stitched (stapled) rather than hard or perfect bound, and usually with attractive covers. Recently published chapbooks generally offer a more refined aesthetic than prototypes of earlier centuries did; however, antique chapbooks have an artistically "organic" nature and provide a record of their cultural history, which makes them highly collectible. A kind of folk art, these small books remain a time-honored literary tradition worthy of preservation and protection.